In 1965, Martin Michaeli founded Mephisto with a singular goal… “To make the world’s finest footwear.” Today, Mr. Michaeli still owns and operates Mephisto from the world headquarters and original factory in Sarrebourg, France. His shoes are now sold in over 80 countries, with the U.S. headquarters located in Franklin, Tennessee. Mephisto represents a world-class product with loyal customers and a brand driven by one man’s unshakable belief that excellence can and will be achieved every day, with every pair. Today, Mephisto’s brands include Mobils, Sano, and Allrounder. Since Mephisto’s introduction of Allrounder in 2003, it continues to gain momentum as a comfortable, high-quality brand. 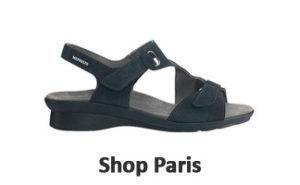 Allrounder footwear uses the finest materials to create casual shoes and sandals that are stylish and comfortable. 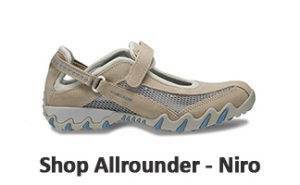 Allrounder shoes make comfort possible by hugging your feet in all the right places. In addition, Allrounder by Mephisto shoes are both unique and durable, bursting with originality and distinctive craftsmanship. 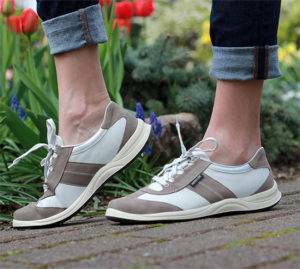 Mephistos are an investment in the health and comfort of your feet, back and legs. The materials, construction techniques and quality components used to make every pair are never compromised. It is not uncommon to get years of wear from a pair of Mephistos. Furthermore, when refurbishment is needed, most of styles are completely recraftable and can be restored to their original specifications. While maintaining high standards of handcrafted excellence, Mephisto is also a leader in innovative technology. Mephisto’s designers and engineers are never satisfied and continue to search for ways to improve the comfort features of our footwear and make the “finest” even “finer”. Come into any one of our stores, located in Anaheim Hills, Rancho Cucamonga, Riverside, San Dimas, Temecula or La Quinta! 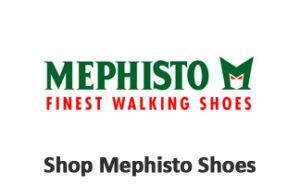 Visit us today and try on a pair of Mephisto shoes! At Lucky Feet Shoes, we carry many Mephisto shoes: wide shoes, heels, and boots; in any of our Southern California stores. If you are looking for Mephisto footwear in Orange County, the Inland Empire, Los Angeles County, Temecula, Riverside; we have six stores to serve you! Come and visit us today! If you are looking for Mephisto shoes in Anaheim, Anaheim Hills, Yorba Linda, Brea, Orange, Placentia, Fullerton, Irvine, Villa Park or Tustin; visit our store in Anaheim Hills. See store on map. If you are looking for Mephisto shoes in San Dimas, Glendora, Pomona, Covina, West Covina, La Verne, Azusa, Diamond Bar or Claremont; visit our store in San Dimas. See store on map. If you are looking for Mephisto shoes in Rancho Cucamonga, Ontario, Upland, Fontana, Rialto, Chino, Chino Hills, Mira Loma, Eastvale, Colton or San Bernardino; visit our store in Rancho Cucamonga. See store on map. If you are looking for Mephisto shoes in Riverside, Moreno Valley, Corona, Rubidoux, Loma Linda, Grand Terrace, Redlands or Norco; visit our store in Riverside. See store on map. 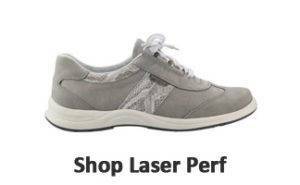 If you are looking for Mephisto shoes in the Temecula Valley, Murrieta, Fallbrook, Lake Elsinore, Wildomar, Hemet, San Jacinto, Pala, Sun City, Menifee, Canyon Lake, Perris, Bonsall or Anza; visit our store in Temecula. See store on map.